So I watched Invicta FC 22 last night. The problem was my UFC Fight Pass feed was on a five minute delay which is why I didn't tweet much last night. As usual, I watched the show on my TV via Roku. I don't recall that happening in the past and I don't know what causes it or if there is a way to fix it. If someone knows, let me know and I will look into it. The problem with last night's show happened when three fighters missed weight. Janaisa Morandin missed weight by five pounds and her fight vs Jinh Yu Frey was cancelled. I can't imagine why a fighter would come all the way from Brazil to miss weight. I blame Invicta for the other two. DeAnna Bennett and Miranda Maverick are Flyweights trying to drop to Strawweight. But neither has ever made weight for a Strawweight bout. I understand why they want to do that. But they are making Invicta look like schnooks for continuing to book them as Strawweights. Invicta needs to be smarter than that. These two fighters missing weight was predictable. Was anyone surprised? There's no excuse for it. 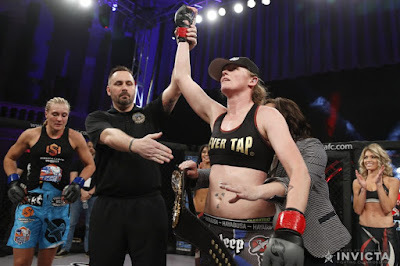 The main event had Tonya Evinger defending the Invicta Bantamweight Championship against Yana Kunitskaya. Of course it's a rematch of the match that was declared a no contest after Tonya successfully appealed due to ref Mike England's stupid mistake. This fight went as I thought the first fight would go. In the first round, Yana attempted a guillotine and then tried several leglocks. I thought Yana won the first round. but I also thought she should have given up on the leglocks which are all low percentage submission attempts. They weren't going to work. So Tonya rode out the round and came back to finish Yana with a rear naked choke which is a much higher percentage submission. So congratulations to Tonya. Of course fans are all "Gosh, why isn't Tonya in the UFC?". I have covered Tonya's entire career and her one bad habit is she burns bridges. And that's what she has done with UFC matchmaker Sean Shelby. She talked about this in an interview the other day. If I was managing her, I would tell her to make amends with Shelby. I don't know if she will do that but it seems like she's leaving a lot of money on the table for pride. This is not new. She's always been like this. She won't swallow her pride. She needs them more than they need her. In the co-main event, Invicta Atomweight Champion Ayaka Hamasaki moved up to Strawweight to take on former Invicta Strawweight Champion Livia Renata Souza. Ayaka fought at Strawweight early in her career. There wasn't much happening in this fight and then Livia landed a big punch to the temple and it's over. It was one of those things where the punch landed in the right spot to get a KO. But ref Mike England missed that Ayaka was out and allowed Livia to continue until he stopped the fight. There's no excuse for that. We also had Jodie Esquibel win over DeAnna Bennett by split decision. So though it wasn't announced, that sets up Livia vs Jodie for the vacant Strawweight belt. I favour Livia to win because she's a finisher as long as she isn't overconfident. Ashley Cummins made her Atomweight debut against Amber Brown who was returning to Atomweight after losing at Strawweight. It was a close fight but I thought Ashley won and the judges gave her a unanimous decision. I liked Iceland's Sunna Davidsdottir when she made her Invicta and MMA debut a few months ago until I discovered she is 31 years old. That's a little old to be a prospect. Her opponent was Colorado's Mallory Martin in her Invicta debut. I thought Sunna won the first two rounds but then pooped out in the third. But she survived and won by unanimous decision. Her endurance concerns me. So maybe she should have one more fight at Invicta and maybe she will be ready for the UFC. She has been training at Tristar in Montreal and Joanne Calderwood was in her corner. Maybe those guys can fast track her into the UFC. No matter what anyone tries to tell you, her age is an issue. Miranda Maverick, who missed weight for the second time, won over Kal Holiday by first round submission. Miranda's future bouts should be at Flyweight. And in the opening Welterweight bout, Felicia Spencer won by unanimous decision over Madison McElhaney. Felicia is from Montreal but she now trains in Florida. Of course the other big Invicta news yesterday was that Cris Cyborg vacated the Welterweight belt. That could be good news for someone like Felicia. Invicta didn't announce any future shows.